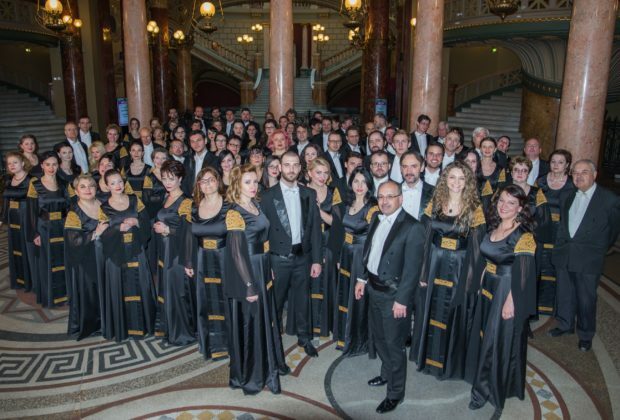 The “George Enescu” Philharmonic Choir was established in 1950. Up to that point, great vocal-symphonic works had been only sporadically performed on Romanian stages, mostly by private and semi-professional choirs which didn’t always correspond to the level of the Philharmonic Orchestra. The New State Choir brought about a true change of the general public perception concerning the classical music. In its tireless and rich activity – oratorios, masses, motets, A Cappella concerts – the vocal ensemble performed all masterpieces from Monteverdi to Bach, Haydn to Brahms, to the most avant-gardist works of contemporary music. The careful selection of the choir members, as well as the collaboration with notorious conductors contribute both to maintaining the professional level next to the standards of the Philharmonic Orchestra. Since 1990, the “George Enescu” Philharmonic Choir took part in extraordinary events of the Romanian musical life. In 1995 it had the chance to work with the great Polish composer Krzysztof Penderecki and in 1998 it performed a concert version of the opera “Oedipe” by George Enescu together with the Orchestre National de France and Lawrence Foster, during the “George Enescu” International Festival. The conductor and pianist Iosif Ion Prunner, member of a well-known family of musicians and intellectuals in Romania, took over the leadership of the “George Enescu” Philharmonic Choir in 1997. During his tenure which already spans over two decades, the conductor of the Choir has encouraged the expansion of the choir repertory and supported as well the solo appearances of the choir members. In this case, he often plays the role of the accompanist on the piano in chamber music evenings. As part of the European musical circuit, the “George Enescu” Philharmonic Choir goes regularly on international tours, having already performed in Spain, France, Italy, Bulgaria, Greece. Among the most important recent achievements are worth mentioning the collaborations with first calibre orchestras and conductors at the “George Enescu” Festival: Daniel Barenboim and Staatskapelle Berlin (2013, in Verdi’s Four Sacred Pieces), Vladimir Jurowski and The London Philharmonic Orchestra (2017, in Enescu’s opera “Oedipe”, which was repeated shortly after in the season opening of the same British orchestra).